Firefighters in southern California are continuing to battle three separate wildfires that have destroyed hundreds of homes and forced thousands to flee. 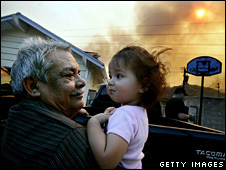 The fires, to the north, north-west and south of Los Angeles have burnt through dry forest, hitting suburban areas. After visiting the city, California Governor Arnold Schwarzenegger said it had been "a very tough few days". States of emergency are in place in four counties but calmer winds are helping fire crews contain the blazes. More than 800 homes, ranging from multi-million dollar mansions to more modest mobile homes have been destroyed. 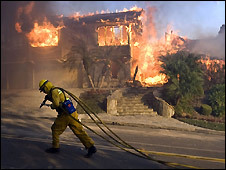 About 22,000 acres (8,900 hectares) have been scorched and 50,000 people have been ordered to evacuate their homes from Santa Barbara, north-west of Los Angeles, to the suburbs in the south-east of the city. The most threatening fire is now to the south-east of Los Angeles in Orange and Riverside counties. It broke out early on Saturday and quickly spread through a number of suburban communities running up into the canyons of Chino Hills State Park. Initially separate blazes have merged into what fire officials are calling the Triangle Complex fire. As of Sunday morning, it was mostly uncontained and had burnt through more than 10,000 acres (4,000 hectares). About 1,200 firefighters are trying to contain the blaze which has already damaged or destroyed 150 homes, many of them in Yorba Linda. 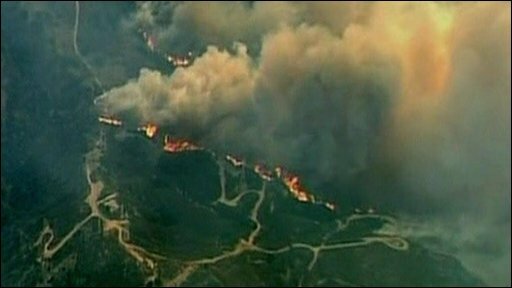 Fierce Santa Ana winds of up to 80 mph (130 km/h) initially fanned the blaze, helping the flames jump canyons and spread into built-up areas. However, they are forecast to drop to between 25 and 45mph (40-72km/h), raising hopes that fire crews may be able to take control. Gov Schwarzenegger has declared states of emergency in Orange, Riverside, Los Angeles and Santa Barbara counties. The declaration allows state resources to be used to help local crews fight the fires and shelter people who have evacuated their homes. After visiting affected areas on Sunday, he praised those who had been fighting a "perfect storm" for the last three days. "With all these fires all over, this is usually what happens at this time of the year, when we have the perfect storm, which means basically we have high winds, high temperatures and very, very dry [conditions]". He said another serious fire, centred on Sylmar in the San Fernando Valley, was 30% contained. That fire broke out very late on Friday and forced 10,000 people to evacuate their homes. He said 9,400 acres (3,800 hectares) had been burnt and 630 buildings destroyed - included about 500 mobile homes that were completely incinerated. The fire jumped into the Oakridge Mobile Home Park from the adjacent Angeles National Park in the early hours of Saturday and raced from one mobile home to the other. "It was an absolute firestorm," said Los Angeles Fire Department Captain Steve Ruda of the Oakridge blaze. "Firefighters were braving 50ft flame lengths as they swept across the mobile homes," he told the Reuters news agency, adding that heat from the flames had melted his firefighters' hoses to the road. "We have never lost in recent times anything close to this number [of homes]," said Los Angeles Mayor Antonio Villaraigosa. 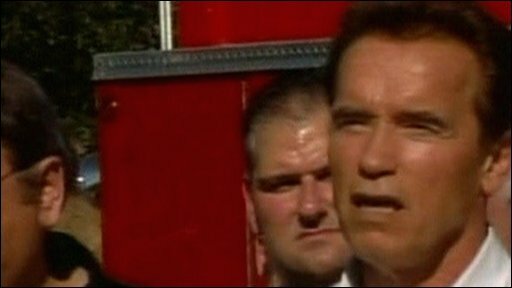 Mr Schwarzenegger said 1,031 firefighters, 211 fire engines, 12 helicopters and 15 bulldozers were working to keep the flames away from the built-up areas. The two fires have sent pillars of smoke into the air that can be seen across the Los Angeles area. 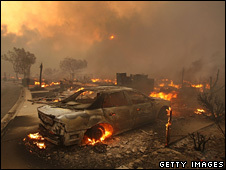 Television pictures showed entire hillsides ablaze and burning embers flying through the air, pushed by the high winds. At least 11 injuries have been reported in the two Los Angeles fires, including nine firefighters. No deaths have so far been reported, although Los Angeles Police Chief William Bratton said he feared bodies might be found at the Oakridge Mobile Home Park. Investigators have so far examined about 30% of the site using search dogs. A fire burning since Thursday in Santa Barbara, on the Pacific coast about 90 miles (144km) north-west of Los Angeles, has been 80% contained, firefighters have said. Santa Barbara County spokesman William Boyer said 130 homes had been burnt in the city of Santa Barbara and another 80 in the adjacent community of Montecito - home to many wealthy celebrities. Multi-million dollar homes have been turned into smouldering piles of rubble surrounded by a grey, ash-coated landscape in the secluded area that is home to celebrities including Oprah Winfrey and Michael Douglas. Mr Boyer said about 1,500 acres of land had been scorched. At least 13 people have been treated for burns or smoke inhalation. Such wildfires are an annual feature in southern California, but many officials say this year's have been the worst in decades. SAYRE: Los Angeles County nr Sylmar. Fire has consumed 10,077 acres and is currently 40% contained. Some 630 buildings and 500 mobile homes were destroyed on Saturday.